Explorer 1 [PRIME] (E1P) is a Montana Space Grant Consortium Cubesat-class satellite in development by the Space Science and Engineering Laboratory (SSEL) at Montana State University. It’s mission is to detect the Van Allen radiation belts in honor of the 50th anniversary of Explorer-1, America’s first satellite that first discovered the cloud of highly energetic electrons trapped in the Earth’s magnetic field. E1P will carry a miniature Geiger tube donated by Dr. Van Allen using it to measure the intensity and variability of these electrons in low earth orbit. 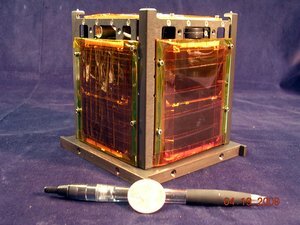 NASA’s Educational Launch of Nanosatellites also called ELaNA mission has selected E1P to fly in its “Glory” mission scheduled for February 2011. The launch on a Taurus-3110 failed on 04.03.2011 when the payload fairing did not separate. A second flight model, E1P U2, was launched through the NASA Educational Launch of Nanosatellites (ELaNa) program in October 2011. After reaching successfully orbit, it was renamed HRBE (William A. Hiscock Radiation Belt Explorer). After deployment, E1P U2 stayed magnetically attached to another cubesat, M-Cubed/COVE. The exact cause of the conjunction is unknown, and it is hypothesized that it was caused by the magnets in both satellites. Both CubeSats include a permanent magnet for passive attitude control. HRBE did not suffer due to this connection. Launched and active. E1P is scheduled to launch on 28 October 2011 from Vandenberg Air Force Base in California. The only thing is, that E1P and M-Cubed are connected to one another. It looks that after the launch from the P-POD and in a later orbit the two Cubesats where entangled. This means that both E1P and M-Cubed have the same NORAD catalog number. Explorer-1 [PRIME] groundstation setup and decoding. The transmitter used onboard the spacecraft has a crystal oscillator that suffers from extreme temperature fluctuations. This means that general purpose Doppler correction software used by many amateurs is unsuitable for tuning the E1P downlink. The instability of the oscillator causes a drift up to 12 kHz above and below the center frequency. This means that the transmit frequency may be anywhere between 437.517 MHz and 437.493 MHz. To overcome this limitation, the E1P on-board transmitter sends a 1200Hz tracking when USB and 2200Hz tracking tone when LSB in each beacon transmission. 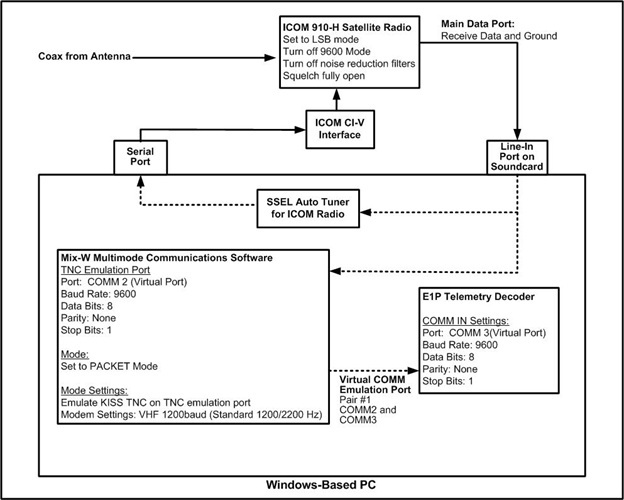 The tracking tone is sent before each telemetry packet to allow the ground operator to manually adjust the receive frequency to properly decode the packet.